With nearly 5,300 acres of world-class skiing and snowboarding terrain, it can be easy to feel overwhelmed with a day or eight at Vail. But for intermediate skiers – those who enjoy mostly green, blue and some black runs – the size of the mountain offers a giant learning environment with dozens of runs to develop skills and gain confidence while working up to the steeps, deeps and bumps of Vail’s vast terrain. So on your next day on the slopes grab a map, follow this scavenger hunt across the mountain, and get ready for a whole lot of intermediate fun. Regardless of where you start your day, the front side of Vail is loaded with incredible intermediate terrain and plenty of places to warm up, from the easy cruising and open spaces of Practice Parkway, Over Easy or Swingsville, to the rolling hills of the Sourdough lift. Build up to (or even start with) the lighter blue slopes of Ramshorn, Avanti, or Mid-Vail Express, then flex your bump legs on Powerline or test the tempered steeps of Northwoods or Avanti. 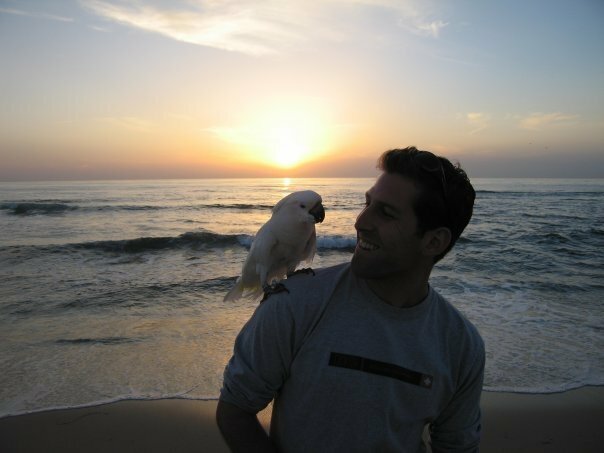 The idea is to build up confidence early in the day and early in the week, to feel comfortable attacking more varied terrain later on. Don’t think that just because you’re an intermediate skier that you can’t fully enjoy the Back Bowls of Vail. The bowls should be far less intimidating than they are, and are worth exploring at just about any level. 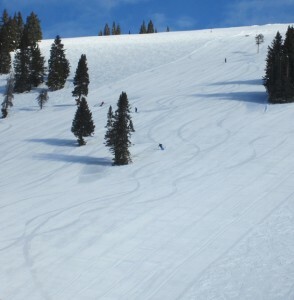 The smooth rollers of Lost Boy and Dealer’s Choice in Game Creek Bowl are already fan favorites, but China Bowl also has easily-accessed blue terrain such as Poppyfields West and Chopstix, and even Blue Sky Basin has adventurous intermediate runs like Cloud 9, Big Rock Park, and Grand Review. You can be even more bold on a heavy powder day– the snow will slow you down and ease your falls, and learning to ski powder in the back bowls of Vail is a feeling you will never forget. Intermediate can be a vague and malleable term, so feel free to challenge yourself on some of the more varied terrain of the mountain. If you’re trying to improve your bump skiing try Wildcard, Kangaroo Cornice, or Baccarat. Go off-piste in bowl runs such as Yonder, Shangri-La and Resolution. Get comfortable with the steeps of North Star or Blue Ox, or try a run at Riva, the mountain’s longest run. Challenging yourself to ski outside of your comfort level is not only a great way to improve, but it’s also how you discover the treasure chest that is the rest of Vail Mountain. The average skier can burn up to 3,000 calories in a day on the slopes, so fueling up is key to keeping those legs swishing through the snow. With all the choices across the mountain, there should be no need to fall into any kind of cyclic routine. Be sure not to miss the peak-smoked barbecue, wild chicken and rice soup, mac and cheese and homemade cornbread of Vail’s Wildwood Smokehouse. Change your boots for slippers and relax into the mid-mountain fine dining experience of The 10th, which is now open for lunch, après and dinner. Warm the belly after a morning in the back bowls with your own heaping bowl of Chili, an epic Epic Burger, or a helping from the mountain’s largest salad bar, all offered with luxurious views from the pine lodge construction of Two Elk. Accidents can happen on the “last run of the day” when skiers are tired and often all trying to get off the hill at once. Traversing along Gitalong Road or Lion’s Way are the easiest routes down to the bottom (although be wary of downhill skiers), while Bear Tree and Born Free are enjoyable runs for most intermediates. Finally, don’t be afraid to download one of the lifts if you’re tired, or if you’re simply not comfortable with conditions. Plan your ending and save your season by always playing it safe. For a personalized tour of the mountain, visit the Vail Ski and Snowboard School to book an intermediate (or any level) lesson.